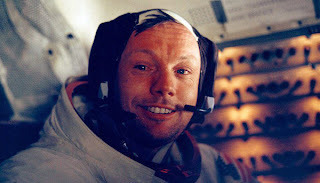 Today the National Cathedral in Washington, DC celebrated and remembered the life of Neil Armstrong, the quiet farm boy from the Midwest who dreamed of flying, joined the navy, was selected to train as one of the first astronauts and made history when he stepped onto the surface of the moon on July 20, 1969. That was a seminal moment not just in US History but in world history. For those of us who watched Star Trek and dreamed of going where no man has gone before, Neil Armstrong, and his colleagues Michael Collins and Buzz Aldrin flew to another world. Aldrin and Armstrong landed on the surface of the moon using the lunar module while Michael Collins remained in the command vessel. My parent woke us up for the big event. The family gathered in my parents’ bedroom to watch the “one small step for man, one giant leap for mankind” on their 13 inch black and white TV. We sat mesmerized, watching what we believed was a modern miracle. Most Americans were glued to their television sets whenever there was a rocket launch during the 1960’s. This was the space age. We tuned in to every event with awe. This was the fulfillment of Kennedy’s dream. This was a triumph of American ingenuity over the Soviets. This was competition at the highest level. And Neil Armstrong, the all American man, took that first step. As a child of the 1960s, I grew up with the space race. We watched Alan Shepherd soar as the first American in space, closely followed by John Glenn as the first American to orbit the earth. I wrote my 8th grade science paper on the space program – the Mercury and Gemini astronauts – these heroes who I risked life and limb for science. I celebrated my 10th birthday the day after the moon landing. It was a National holiday. My mom decorated my cake with astronauts and a lunar lander – like the one we’d seen at the Kennedy Space Center when the landing was in the planning stages. Part of me felt they’d done it for me. Neil Armstrong was an American hero. The Apollo 11 crew had a ticker tape parade in New York City. But none of the Apollo 11 astronauts exploited their fame. Despite the giant leap for mankind, Neil Armstrong remained a private man. I so admire his commitment to America and his need to retain his privacy. He will always be a hero – but in a quiet, classy, unassuming way. It is fitting that there is a small piece of moon rock in one of the stained glass windows at the National Cathedral. Mr. Armstrong is to be buried at sea tomorrow. God speed humble warrior. And thank you for your service to America.